Easy-turn knob adjusts light to favorite light level. Press down to turn on and off. Easy-turn knob adjusts light to favorite light level. Press down to turn on and off. Soft glow locator light helps you find the dimmer in the dark. Easy-turn knob adjusts light to favorite level. Press down to turn on and off. 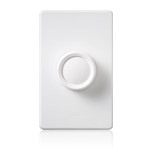 The eco-dim models saves users at least 15% in energy costs as opposed to a standard switch. Easy-turn knob adjusts light to favorite light level in addition to on and off.